With the economic undertow growing, layoffs continuing at finance firms and tough times for real estate-related businesses, how safe is your finance job? Experts say some finance niches, such as accounting, are more recession-proof than others. And certain industries will continue to be strong employers of finance professionals, including software development, healthcare, public accounting, internal audit and commercial construction, according to Kathleen Downs, division director, finance and accounting, for Robert Half International’s Orlando, Florida, office. On the finance side of the corporate world, demand is solid for clerks and staff-level candidates but tougher for senior finance professionals, says Jonathan Claggett, president of DellBridge, a Columbia, Maryland, accounting and finance search firm. 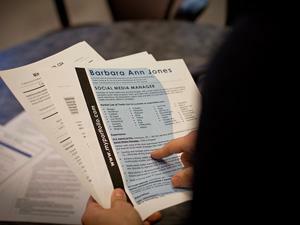 “I’ve seen solid senior candidates on the market for eight months,” he says. Move Away from the Mortgage Market? The cuts in financial services have been the deepest, with companies laying off 129,000 employees in the first three quarters of 2008, according to data from outplacement firm Challenger, Gray & Christmas in Chicago. “There has been a lot of turmoil that has affected not just mortgage companies directly, but those professions affiliated with the mortgage industry, such as title, real estate and appraisal,” says Scott Stern, CEO of Lenders One Mortgage Cooperative in St. Louis. If you want to stay in mortgage lending, the most stable employers are prime mortgage lenders with a long track record of doing business through down real estate cycles, he adds. While the mortgage market may be cyclical, it’s always active, adds Daniel Jacobs, CEO of 1st Metropolitan Mortgage in Charlotte, North Carolina. Account executives and loan officers who’ve built loyal customer bases during the good times weather down cycles the best. “People want to do business with someone who continues to build, or at least maintain, the relationship,” he says. Concentrate on high-net-worth customers, suggests Faith Xenos, founding partner of Singer Xenos Wealth Management in Coral Gables, Florida. “If you’re tied to the midlevel consumer marketplace, you’re definitely seeing negative fallout,” she says. “I’ve heard of firms at that level laying off half their staff. I’d shy away from the big firms, because they put such quick [sales] targets in place and don’t give you enough time to build to the target levels.” By contrast, she starts clients with referrals, such as the offspring of her high-net-worth clients. Maintain, or better yet, improve your information technology skills, certifications and licenses, Downs suggests. Having a certification and solid technology skills will save you from layoffs and move your resume to the top of the pile if you have to job hunt.